Beautifully engraved speciman certificate from the InfoSPI.com . This historic document was printed by the Columbia Financial Printing Company and has an ornate border around it with a vignette of the company's name in various colors. This item has the printed signatures of the company’s president/ceo and secretary/cfo. 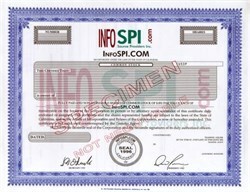 InfoSPI.com is a holding company for on-line information-related providers to the business and private markets, including the arrin System TM , a leading provider of background screening and due diligence research and KeyLaw.com. InfoSPI.com combines the speed of Internet access with the power of information in a process the company refers to as The Art of Information.